Spring is finally here. The Cherry Trees at the Brooklyn Botanical Garden are in full bloom, the mourning doves that nest in the tree on our terrace have returned from their excursion south, and the daffodils planted last fall on the Pratt University campus are blossoming. 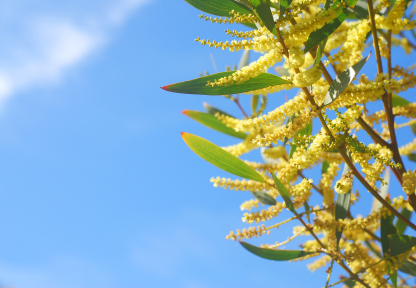 It is a really beautiful time of year but if you are a seasonal allergy sufferer you may wish for this time of high pollen and other seasonal allergens to quickly pass by. Though old man winter was gentle to us in the Northeast this year, there is no guarantee that Lady Spring will be. I have seasonal allergies. Admittedly, they are worse in the fall than during the spring but where I used to take conventional allergy medications and pray for that first big April rain to wash away the allergens or the first freeze to kill them, I now consider other treatments a viable option. I receive regular massage and my allergies are not as bad and I find that the massage treatment lasts longer than a pill. To first understand how massage therapy can alleviate symptoms of seasonal allergies; let’s first understand what seasonal allergies are. An allergy is simply an adverse physiologic result of our immune system to any allergen. Without going into too much detail, we get a whiff of too much pollen and or body begins to release histamines to combat the allergen. The release of histamine however, causes inflammation and injury to tissue. Conventional treatments and medications contain antihistamines or drugs designed to block the actions of our natural histamines. The problem with antihistamines and other conventional treatments such as steroids and decongestants are the unfavorable side effects. There are warnings on allergy medications not to operate heavy machinery as drowsiness may occur. Heart palpitations and arrhythmias or irregular heartbeats may also occur as a side effect to these drugs. Another problem with conventional treatments is that they do not last long. You may have to take another pill in another 6 hours and most medications do not last twenty-four hours. This is why we at LegitMassage advocate regular massage from a licensed massage therapist to help alleviate your seasonal allergies. How does regular massage help and how long does the effect last? We already know massage therapy decreases stress, increases circulation and releases muscle tension. We also understand that while there may not be much research in the matter of how massage therapy benefits seasonal allergy or yearly allergy sufferers, we have scientific proof that the release of histamines is exacerbated by stress. A 2008 study by Dr. Rosalind Wright at the Harvard Medical School, concluded that responses to stress “may influence the expression of immune-mediated disorders such as asthma as well as enhance an individual’s susceptibility to other environmental factors that may also contribute to asthma risk” (Allergy, Asthma & Clinical Immunology March 15 2008). In addition to inducing a relaxed state in which the body is freed to operate more smoothly and optimally, massage therapy addresses physical symptoms as well. When you cough or sneeze, you engage your ribs, neck, shoulders and spine and when you undergo a sneezing or coughing fit as is customary with seasonal allergies, your body can be thrown out of alignment. Remember when Sammy Sosa of the Chicago Cubs had to go on the disabled list for spraining a lower back ligament while sneezing? Additionally, sinus trigger points reside on the neck in the SCM. Recall that the SCM or sternocleidomastoid muscle is the muscle that enables one to glance down for a dropped coin and deeper trigger point therapy to this muscle will address pain that is referred to the sinuses. One of the bonuses of massage for your seasonal allergies is that there are no dangerous side effects. Feel free to hop of the massage table and go back to work as a fork lift operator. Another added benefit is that massage last longer than conventional treatments – oftentimes weeks longer. There are other complementary and alternative therapies to turn to for allergy relief as well. Reflexology encourages sinus drainage and helps to decrease inflammation brought on by histamines. Shiatsu or finger pressure uses acupressure to address specific points on the body to alleviate allergy symptoms. As with any condition, if you are taking prescribed medication, massage and other therapies are not a replacement therapy but a conjunctive therapy. So enjoy the blooming flowers and blossoming trees this spring… I know I will.